The quality of own goals this season are outstanding. Festus Baise’s world-class scorpion-kick own goal in Hong Kong at the back end of 2011 set the trend, while just a few weeks ago lady Costa Rican defender Marianne Ugalde blotched her record as her keeper Julieth Arias forgot how to use her feet in a complete brainfart episode. Tuesday night in Israel served up yet another breathtakingly bad own goal in the cup match between Maccabi Umm al-Fahm and Hapoel Afula. We pick up the action in the 89th minute with Maccabi Umm al-Fahm leading 2-1. 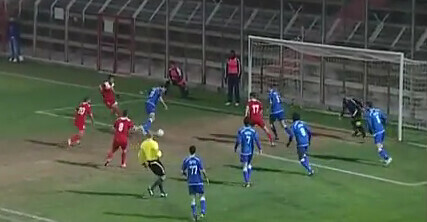 Afula, playing in red, worked the ball out to the right to their number ten Barak Daniel, who delivered a low cross into the Umm al-Fahm area in probably their final roll of the dice in the match. Yet, despite having four Afula teammates in the mixer, Daniel’s cross reached home defender Ashraf Soliman at the back post and even the most degenerate of gamblers would have bet on the chance having gone to waste. Like a man with a death wish Soliman had a complete meltdown once in possession, and in an inexplicable moment of madness he whacked the ball into his own net. The story however had a twist. Having torpedoed his side into playing extra time, Ashraf Soliman redeemed himself scoring the Maccabi Umm al-Fahm winner in the 97th minute. Watch Ashraf Soliman’s insanely awful og here.